Well hello again! I arrived back on Saturday from a fabulous 2 weeks in Portugal, and I'm slowly starting to get back onto Eastern Standard Time. I went into this vacation feeling somewhat under prepared, as I didn't have as much time as I would have liked to plan out our days. However, that worked out perfectly, as it was a much more relaxed vacation compared to our other European vacations. I've had a pretty crazy month work-wise leading up to this vacation, so a bit of a slower pace was just what I needed! But don't get it wrong, we still took in all the sites, and quickly learned that everyday is leg day in Portugal. 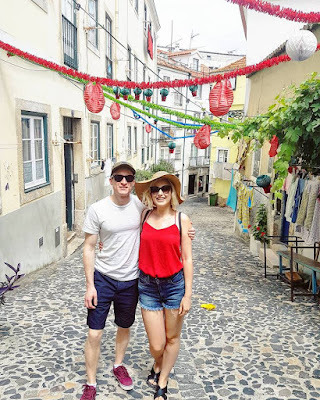 As I'm still a bit groggy, I thought that today I would just share my favourite photos from my vacation, but I do plan on sharing my tips and travel guides for both Lisbon and Porto very soon! Our Airbnb in Lisbon was located in Mouraria, a neighbourhood known for it's great Fado music. The curving cobblestone streets were decorated with colourful streamers to celebrate Festas de Lisboa. One morning when we were walking to the subway, a local stopped us and insisted on taking our photo for us because "it would look so good on Instagram!" I'm so glad he did because I love this picture of Dylan and I! Belem Tower is a must-see attraction while in Lisbon. It is a bit of a trek from the city centre, and we decided to take a tuk tuk to get there! There are tuk tuks everywhere in Lisbon, and while they are quite a bit more expensive than taking a tram or even a taxi, the experience is so worth it. Hands down my favourite lookout point (or "miradouros") in Lisbon is from Castelo de São Jorge. Once you enter the castle grounds you can get a full panoramic view of the city, with red tiled roofs as far as the eyes can see! Did you know that there's a Golden Gate Bridge look-a-like in Lisbon? I've never been to San Francisco, but with the hilly streets and the 25 de Abril Bridge, you might be fooled into thinking that you were in the good old USA. This photo was taken in Almada, on the left bank of the Tagus River. A day trip to Sintra is essential to any trip to Lisbon, just look at how majestic the colourful Pena Palace is! My only regret is that we ended up visiting on a very foggy day, so my photos aren't as bright and cheery as I would have liked. But you can't change weather! 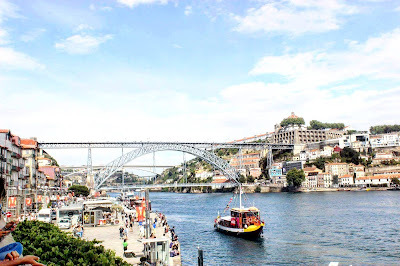 Porto was an absolutely breathtakingly beautiful city, and it was a welcomed change of pace after our time in Lisbon. 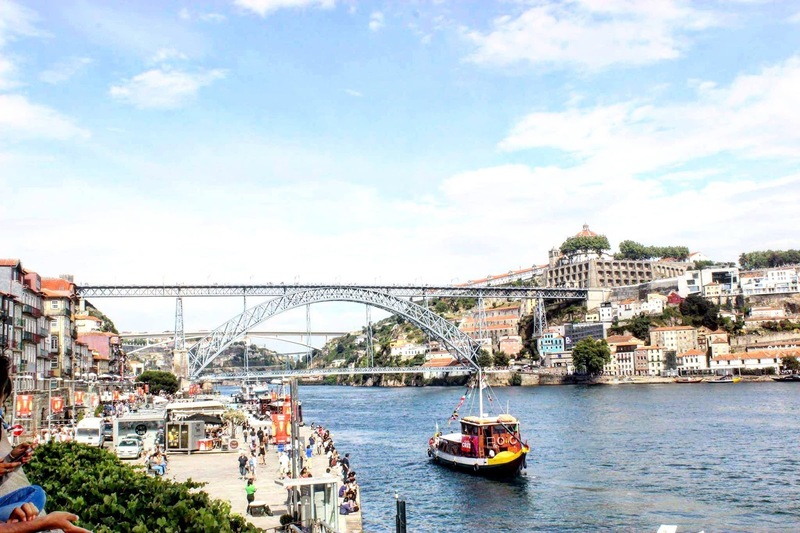 Porto has a much more laid back, relaxed vibe compared to Lisbon. It was nice to take some time to wander over the Dom Luís I Bridge into neighbouring Gaia and take in the views of the Douro River. 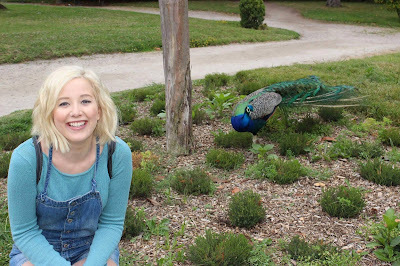 We visited the Palácio de Cristal a few times during our stay in Porto after the wild peacocks stole our hearts. This large garden area has free entry, and is teaming with different species of birds. We saw peacocks with their babies (!!! ), ducks, chickens, roosters, and then the usual pigeons and seagulls. Even if you're not into birds, the park is beautiful and offers great views of the city & the Douro River. This photo was taken on our first afternoon in Porto, and it was pretty much the moment that I knew that I was going to love the city. If you've been considering a trip to Portugal, I would highly recommend it! It's a beautiful country, with so much culture, and there's bound to be something for everyone. If you are currently planning a trip to Portugal and needs any recommendations, please feel free to leave a comment below!